What?! Does something about this article seem odd, not as you remember, or too good to be true? Check the date it was published! Pundits have long speculated that Apple is working on ARM-based builds of Mac OS X that would allow the company to use its proprietary A7 CPU (or successors) in Macs as well as iOS devices. This is nothing new for Apple, which secretly compiled Mac OS X for Intel-based hardware for years while Macs shipped with PowerPC CPUs. But we hadn’t realized how far this work had come until a source inside Apple tipped us off to the fact that Apple is testing OS X 10.9 Mavericks on current iPad hardware. Not only that, but the ARM code is embedded in the shipping version of Mavericks. 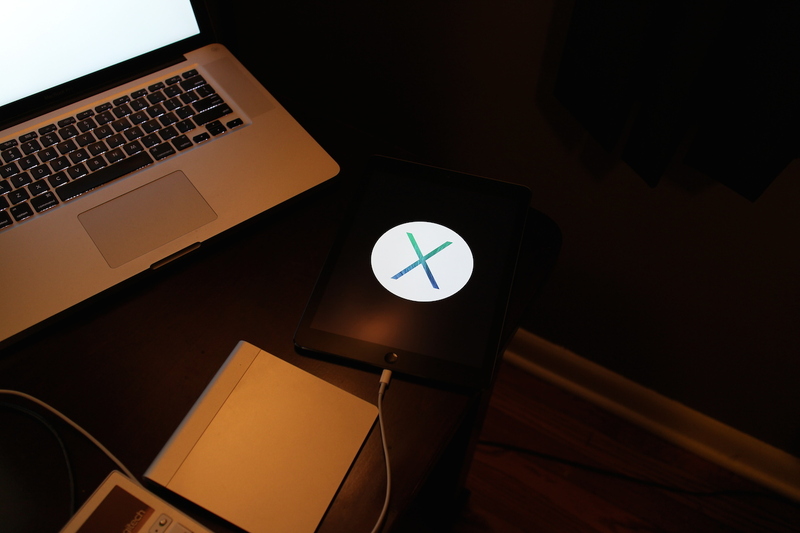 After months of attempts, we’ve cracked how to install and run Mavericks on the iPad Air. The code works only on the iPad Air. Earlier models are not supported, nor is the latest iPad mini, even though it has nearly identical internals. It completely replaces iOS on your iPad Air and wipes your existing data. To remove Mavericks and go back to iOS, you must put your iPad into Recovery Mode and restore through iTunes. If you’re not familiar with that process, don’t even think about trying these steps. Almost nothing works. As with the move from PowerPC- to Intel-based CPUs, a Rosetta-like translation layer will be necessary for existing third-party apps to function, and it’s still missing. The only apps that work are those for which Apple has produced fat binaries: we’ve identified Finder, Terminal, Activity Monitor, Disk Utility, and Console so far. With all that in mind, let’s install Mavericks and get it going. First, download OS X Mavericks (5.3 GB) from the App Store, if you don’t already have a copy of the installer in your Applications folder from a previous install. While it downloads, install Numbers and Keynote on your iPad Air, if they’re not already installed. Save that as ARMboot.plist on the Desktop as well. Once the Mavericks installer has downloaded, connect your iPad Air to your Mac via a Lightning cable and open iTunes. Now would be a good time to perform a backup of the iPad, if you haven’t already, so you can later revert to iOS. In iTunes, select your iPad in the sidebar, click the Apps button, and scroll down to the File Sharing section. Next, select Numbers and drag ARMboot.plist into the Numbers Documents list. Finally, select Keynote and drag MacInstall.plist into the Keynote Documents list. When all the files have been copied, click Sync in the lower right, wait for it to finish, and then eject the iPad and disconnect it from your Mac. Before proceeding, make sure you have a Bluetooth keyboard and trackpad set to pairing mode. Touch doesn’t yet work in Mavericks, but the operating system will look for Bluetooth devices to pair with when it first boots. You can also use the Lightning to USB Camera Adapter ($29) and a USB hub to connect a USB keyboard and mouse, which may be less finicky. Now, turn off your iPad by holding the Sleep/Wake button down for a few seconds. Once it’s off, make sure iTunes is still running, reconnect the iPad to your Mac via USB, then press and hold the Sleep/Wake and Home buttons simultaneously to turn the iPad back on to start the installation process. You’ll know it’s working when you see a black screen with the Mavericks logo. Once the iPad boots in ARM mode, iTunes launches the Mavericks installer on the Mac, and makes the iPad available as a destination disk. The installation process is the same as it would be on a Mac, and when it’s done, your iPad will boot into Mac OS X and work just like a tiny Mac. Enjoy playing with OS X on your iPad, at least to the extent that’s possible today! The Future of the Mac? — What does this mean for the Mac’s future? Apple is obviously working on ARM test builds of Mac OS X alongside the Intel versions, but that doesn’t necessarily mean that the Mac will move to Apple’s A7 CPU any time soon. We know that Apple built Intel versions of Mac OS X for years before making the switch away from PowerPC-based CPUs. These ARM builds could be merely a proof of concept, they could be Apple hedging its bets, or they could even be a bargaining chip with Intel to keep CPU prices down. If the Mac does switch to the A7 or a later version of that chip, the chief advantage would be battery life. Imagine a MacBook Air that could run for 24 hours or more before needing a charge! And it would seem likely that Apple could reduce costs (and prices) by doing so — the estimated costs of the A7 are under $20, whereas the Intel Core i5 chip in the MacBook Air cost $342 at release). But the drawbacks could be severe: less processing power (at least for now), presumably no more Boot Camp, and once again, developers would have to jump from one architecture to another, even with a Rosetta-like translation layer to ease the transition. If Apple could get enough CPU power into a future A-series chip, though, it’s easy to see the company making yet another architecture jump at some point. Fantastic! I just tried this, and the ability to run a dual-screen setup with two iPad Airs is just mindblowing! Unfortunately there is a bug in the system that will reset the date to April 1 every time you boot, but that's really a small price to pay. Hmm, when I try booting the iPad I keep getting a "Sad Mac" with error code "0000000F/00000003", probably from some legacy code. Can you tell me what went wrong? Are you trying it with an iPad Air? It will only work with the Air. If you think that it was legacy code, then possibly you've got some extra software loading at boot. Did you add any extra .plist files to Keynote or Numbers? We didn't try to cover that scenario in this article because even though you can be more sophisticated with what gets installed, the procedure gets complicated fast. actually, i found that this worked with the iPad mini [latest version] if you plugged in the lightning connector upside down. very cool. Good eye! We must have missed that detail in our testing. PowerPC code will run if you add Roseta software to the list. Surprise: Touch interface *does* work, but only in a 666x666 pixel square in the lower-right corner. Weird, and useless of course, but it may point to the full experience being closer than we thought. Hmm. Might have to contact Lirpa Labs for additional support.